Orcutt Painting Company, Inc is proud to offer Interior Painting in Revere Massachusetts. If you have ever tried painting the interior of your Revere MA home or business, you know that its not an easy task. Interior Painting is both a skill and an art. 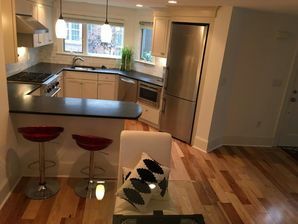 That's why Orcutt Painting Company, Inc's professional interior painters must have several years of experience painting the interiors of homes and offices in and around Revere MA and be familiar with Revere's various interior architectural styles and building materials used in interior construction over the years. When it comes to affordable high quality interior painting Revere resident's can rely on, Orcutt Painting Company, Inc is the interior painting contractor to call! 5★★★★★ - "Rick and his crew were excellent -- I can't think of how they would do better. Rick gave a solid and detailed estimate and his price was what he said it would be. The crew did an excellent job preparing the walls and trim -- filling in small gaps in the corners of the trim on windows and doors. The filled small holes in the walls and then sanded the filler so the surface was smooth. The lines between the gray walls and the bright white ceiling were perfect. The guys didn't leave drops of paint on our recently varnished hardwood floors. This was a very professional job and Rick and crew were a pleasure to work with. I wish all the companies I choose for other services are as good." 5★★★★★ - "Sam was great. Sam knew I was in a rush and was very accommodating, he met Friday night to give an estimate and finished the painting job within a week. On time and easy to get a hold of. I would recommend him for any painting job, I plan to use him again in the future." 5★★★★★ - "He came to see what needed to be done and had an estimate the next day. We agree on the job and set a work date of Dec. 6th. They came worked and hard till the job was finished. All looked good until the next sunny day. I saw problems with the paint and emailed Rick. He responded the very next morning. He came to see the problem and set out to fix it. I was not happy will the color/finish I had opted for and asked if I could change it. He said I could and for a very nominal price repainted will another finish. The crew came again fixed the problem and painted the room with the new finish. By the way, the day that Rick came to see the problem he also gave me back my payment check. I AM VERY PLEASED WITH ORCUTT PAINTING." 5★★★★★ - "Fully documented contract timely presented as promised after the initial visit. Foreman introduced by the owner on the first day was an excellent communicator. This was extremely important because the owner became ill during the project. The crew on the job promptly each day. If Foreman had to leave informed me when he would return. Quality of work was outstanding including daily clean up." 5★★★★★ - "Orcutt Painting is particularly conscientious as shown by the quality of their work. They are a pleasure to deal with and is very client focused." 5★★★★★ - "Very professional from quote to finish. Great quality work." 5★★★★★ - "My husband and I were beyond thrilled with the work provided by Orcutt and his team. They are responsive, punctual and extremely professional. We were so impressed with their attention to detail and the overall quality of the work. While working in our house they were respectful and extremely neat. They were so accommodating of our ever-changing schedule because of all the other work that was being done in our house and we couldn't be more appreciative! They completely transformed our home and it looks absolutely beautiful. I would hire Rick and his team again in a second!" 5★★★★★ - "My guest room came out PERFECT !! Sam made sure that the walls and ceiling came out perfect he kept saying I am not leaving until your happy ;-) I would hire him again in a minute." 5★★★★★ - "Sam is a true professional. He is extremely knowledgeable and his price for painting my two bedroom condo was very reasonable. He worked around my schedule to get the job done on short notice and in time for my move. And to top it off, the quality of the job he did is superb. I have already recommended him to friends and colleagues, and I further recommend his services to anyone in need of painting services." 5★★★★★ - "Excellent!! On time, perfect paint job, I would hire Sam again and again." 5★★★★★ - "We had Sam stain our deck and replace some boards, and he and his crew did a great job. Sam shows up when he says he will and did a very professional job. Would highly recommend him and his crew." 5★★★★★ - "I chose Sams Painting Services based on a friends recommendation, he helped me pick colors and used high quality paint and were easy to communicate with!! Sam and hes crew did a fantastic job at a good price and i wouldn't hesitate to recommend to anyone." 5★★★★★ - "I have hired Sam several times to paint and stain the luxury properties I manage in Cambridge. He has painted the interior of two properties and done some delicate stain work on a large outdoor pagoda and bench. Sam is thorough, careful, and pays a lot of attention to detail. These are high-end properties and the finishes have to be perfect. Sam takes the time to explain the benefits and drawbacks of various approaches. He is also very trustworthy and respectful of my tenants. I have hired him several times and he is now the company I go to for all painting, staining, and finishing." 5★★★★★ - "Sam is thorough, careful, and pays a lot of attention to detail. These are high end properties and the finishes have to be perfect. Sam takes the time to explain the benefits and drawbacks of various approaches. He is also very trustworthy and respectful of my tenants. I have hired him several times and he is now the company I go to for all painting, staining, and finishing. Prices have ranged from $300 to $3500. I have hired Sam several times to paint and stain the luxury properties I manage in Cambridge. He has painted the interior of two properties and done some delicate stain work on a large outdoor pagoda and bench." 5★★★★★ - "Sam did an excellent job painting my house. The whole process was so easy from scheduling the first visit, to getting a detailed breakdown of the price, to selecting the colors and getting the house painted... I really enjoyed working with him and his crew. Sam was patient answering all my questions, and he always offered me his full attention whenever we talked. I will use Sam's company again in the future. Thank you to Sam!"